The velocity and direction of the wind are the net result of the wind generating forces. The winds in the upper atmosphere, 2 – 3 km above the surface, are free from frictional effect of the surface and are controlled by the pressure gradient and the Coriolis force. An air parcel initially at rest will move from high pressure to low pressure because of the Pressure Gradient Force (PGF). However, as that air parcel begins to move, it is deflected by the Coriolis force to the right in the northern hemisphere (to the left in the southern hemisphere). 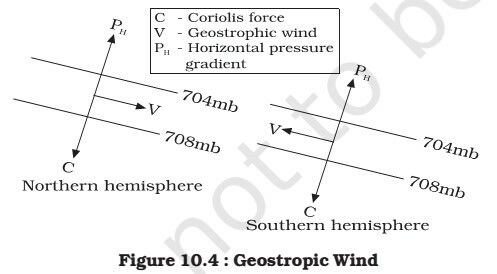 As the wind gains speed, the deflection increases until the Coriolis force equals the pressure gradient force (2 – 3 km above the ground, friction is low and winds travel at greater speeds). At this point, the wind will be blowing parallel to the isobars (perpendicular to Pressure Gradient Force). When this happens, the wind is referred to as geostrophic wind. 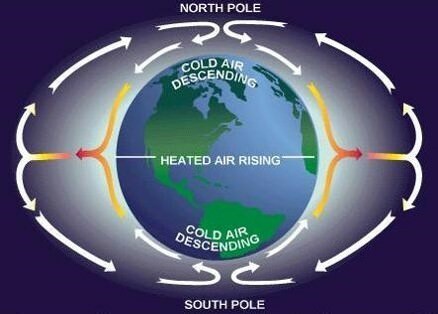 Why winds don’t flow from tropical high pressure (in upper troposphere) to polar low (in upper troposphere) directly as shown in figure below? Because these winds are geostrophic, i.e., they flow at great speeds due to low friction and are subjected to greater Coriolis force. So they deflect greatly giving rise to three distinct cells called Hadley cell, Ferrel Cell and Polar cell. Instead of one big cell (as shown in fig) we have three small cells that combinedly produces the same effect. are a part of upper level westerlies. Jet streams are winds that circle around the earth with poles as their centers. The stream of air is very narrow (50 -150 km across) and, the air in the stream is directed towards the axis of the stream making it very narrow. When the temperature contrast is maximum, jet stream flows in near straight path. But when temperature contrast reduces, the jet stream starts to follow a meandering path. So meandering depends on temperature contrast (temperature gradient). A meander is called peak or ridge if it is towards poles and trough if it is towards equator. The meandering jet streams are called Rossby Waves. Rossby waves are natural phenomenon in the atmosphere and oceans due to rotation of earth. In planetary atmospheres, they are due to the variation in the Coriolis effect (When temperature contrast is low, speed of jet stream is low, and Coriolis force is weak leading to meandering) with latitude. 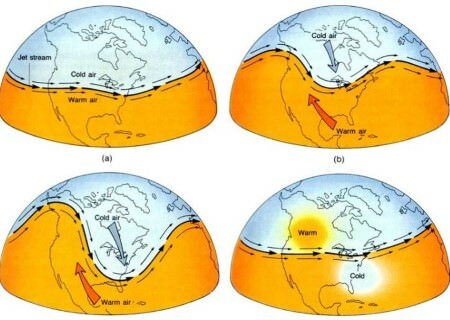 Rossby waves are formed when polar air moves toward the Equator while tropical air is moving poleward. The existence of these waves explains the low-pressure cells (cyclones) and high-pressure cells (anticyclones). Jet streams flow just below the Tropopause. Polar jet streams flow 6 – 9 km above the ground and Sub-tropical jet streams flows 10 – 16 km above the grounds. Why this difference in height? Recall that troposphere is thicker at equator –– 17 to 18 km, than at poles –– 8 to 9 km. Pressure gradient increases with altitude and creates high velocity winds at higher altitudes. The friction in the upper troposphere is quite low due to less denser air. Hence the Jet streams flow at great velocities. Temperature also influences the velocity of the jet stream. The greater the difference in air temperature, the faster the jet stream, which can reach speeds of up to 250 mph (402 kph) or greater, but average about 110 mph (177 kph). The jet streams have an average velocity of 120 kilometres per hour in winter and 50 km per hour in summer. These jet streams also have cores where the speed is much greater. Direction of the jet stream is determined by pressure gradient force (temperature contrast creates pressure gradients) and Coriolis force. The direction of jet stream is perpendicular to the pressure gradient force. 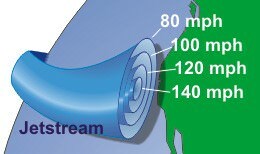 The winds surrounding jet streams are of comparatively low velocities. 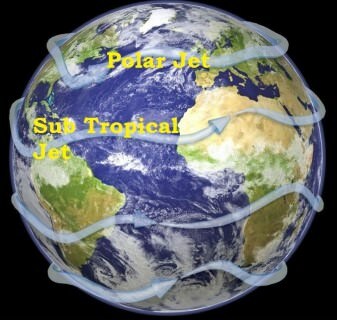 Jet streams are produced due to winds flowing from tropics towards poles (In polar jet streams wind flows from temperate region towards polar region, and in sub-polar jet streams winds flow from sub-tropics towards temperate region). Anything moving from tropics towards poles deflects towards their right in the northern hemisphere and towards their left in the southern hemisphere due to Coriolis effect. 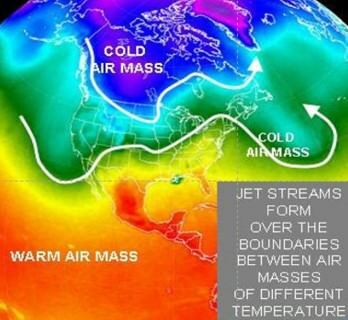 So jet streams flow from west to east in both the hemispheres and hence they are called westerlies or upper level westerlies. Jet streams when weak move in the direction of westerlies in a wavy, irregular manner with a poleward or equator ward component.